I am a mainline pastor-theologian (Presbyterian) who is trying to decide on a program to store/ORGANIZE my digital papers. Scans of books, articles, etc. I average 50+ of these docs each week. I want to organize these papers. I would like to be able to get them out of the program if it is discontinued. My church will purchase Devonthinkpro if I want it. I am not a fan of Evernote’s subscription model, but I can live with this. I write sermons, articles, working on several books of commemtaries, and various other publications. I am very impressed with the knowledge on this forum and would really like any recommendations, even outside the programs I listed. It would need to be Mac centric since this is what my churches uses. Thank you and any response is appreciated. I use DEVONthink Pro and it works well with the Archive. I also works well with Mail App and OmniFocus. Some people on this site use it and also have some scripts and Keyboard Maestro macros that work with it. Thanks Davidrcalvert! I also have Omnifocus and debating on using it or Taskpaper, but since Mail and Omnifocus on Archieve work well with DEVONTHINK PRO, this is definitely a vote for DEVONthink. Archive is quickly becoming the center of all my research and work! As an alternate perspective: I just keep my documents (mostly PDFs and docxs for the kind of work I do, also writing, but more fiction as well as articles) in a dedicated directory (which has the advantage of being synced by dropbox as well), but I name them with a zk-style UID, so like "201903211836-InterestingPaper.pdf". That way I can reference them in my text notes the same way I do zk linking. Emails and bookmarks I treat differently, as I use org-mode for these things (and I'm not going to suggest you use org-mode because it's less a piece of software and more a lifestyle choice). But my way of dealing with PDFs might be worth considering. I'd like to ask before anything I can recommend: What is the reason that so much accumulates? Could it be a case of Collector's Fallacy? Good question. I’m still study this process, so some of it may be the CF. OTOH, I’m on 8 committees and have to keep minutes, financial statements, etc. plus, I do counseling with 40+ people, and I need records of each session for legal reasons and to review their case for each meeting. This is not counting notes for sermons and commentaries and articles. I am reading Sonke right now and have already cut back on the Zettels trying to keep only what I absolutely need. I will consider this—I especially like the file id idea and connecting them with plain text notes, since the Archive is becoming the center of my workflow. Is the directory just one folder or a hierarchy? Since I deal with clients for counseling, I would need a way to bring all their relevant information up quickly so I am able review (quickly) before a session. Dumb question-can a link in The Archive bring up a pdf or docx? The reason I suggest you have a look at it is that Notion allows you to easily switch between "document thinking" and "list thinking". File systems with their folder/document hierarchy are about, well, documents :-) You have to come up with one (or at least a primary) structure for your documents. You can do that, too, with Notion. It's working like any other file system or Wiki, if you want to. But the beauty of Notion is, there is an alternative way: organize your "notes" (your content) as structured entries in tables. Structured means you can add meta-data as you like in addition to plain text. Needless to say: you can easily link from one document/entry to another. And of course you can set up relationships between table entries, eg easily collect all counceling notes inside a client note. Notion is subscription based, but it's cheap. This is an interesting alternative. I looked on the webpage and was unable to find the format of stored information. .txt is pretty important, since I have numerous notes in this format. Also, how hard is it to get one’s information out of notion in case the company goes under. Unable to find on website details about this. Also, thank you for the major write up. Does Notion.so have the ability to replace The Archive and a program like Devonthink Pro? It seems from what I read on the website that replacing Evernote with Notion.so is a possibility. Notion’s note taking seems to have a lot of detractors. Format of stored information: Proprietary. All data is stored in the cloud in a database. As you see, the PDF can be either just stored in the "page" or even be embedded so you can read it right away. 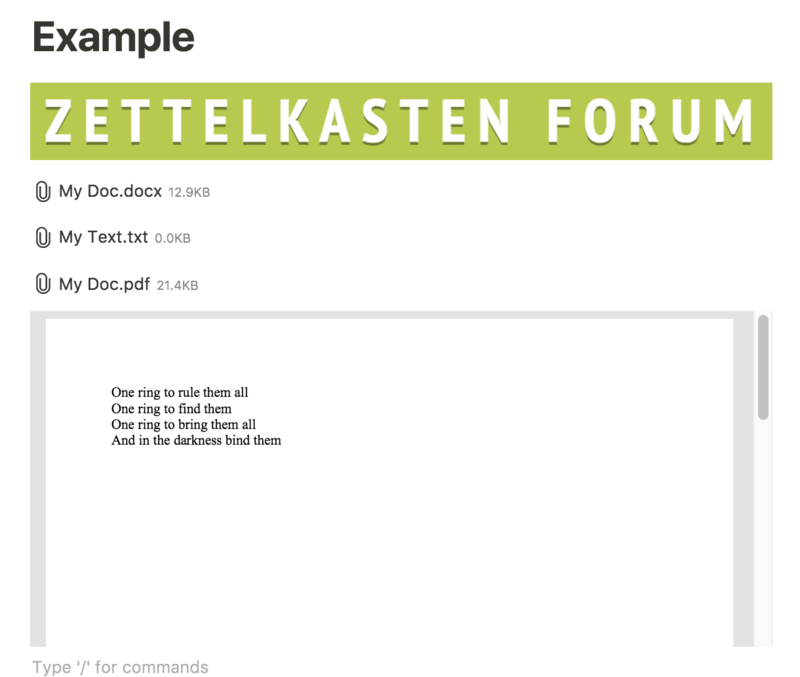 With your .txt notes the question might be: Why keep the notes as .txt at all? Why not make them "pages" themselves? Company going under: You can export all your Notion content to Markdown files at any time. You have to weigh the risk of Notion going under against the benefits of being able to store data the ways they are offering. After having used The Archive for a year I was tired of the "prepper mentality" it and the usage of other apps stand for: to not rely on higher technology than plain text files with Markdown added. Rather I like to organize my zettelkasten by using up to date technology for high fidelity zettels containing all sorts of media and different data structures. Sure, Notion or any other more evolved tools than Notepad also have their drawbacks and quirks. But for my personal taste Notion's benefits outweigh more basic tools. For now. What will be in 5 years, I don't know. But I'm ready to move on. I don't need to find the one final and last tool for all times today. Ability to replace: Who know's? But why's it important to know in the first place? I'm also using TickTick for tasks "too small" to put on my Kanban board in notion. And for temporary notes. I'm also using BusyCal for my calendars because the UI is more honed for structuring my time. A lot of detractors: Well... success and innovation always spawns rejection and critique. But I believe than Notion (and Coda) are on to something. They stand for a new class of tools. More integration of different formats and media. The future is less about either this tool or that one. It's more about a mix of tools: as-well-as thinking. Notion has potential to replace Evernote and Airtable. But that won't happen, I guess. Because there is room for both: focused, simple tools as well as more complex, comprehensive tools. Good luck with your decision, @sobertruth! I will consider this—I especially like the file id idea and connecting them with plain text notes, since the Archive is becoming the center of my workflow. Is the directory just one folder or a hierarchy? I have a hierarchy, but that is mostly because I don't connect everything to my Zettelkasten and need some kind of structure for selective dropbox syncing. For example, I do a lot of critiques for colleagues, and I keep those in a separate directory so I can easily have just those on my ipad, which is where I tend to read them. What I'm essentially saying is, yes, I have a hierarchy, but that is for reasons unrelated to interaction with ZK. If one is linking by UID, finding things is a filesystem search, so there is rarely a difference between flat filesystem and complex trees. Since I deal with clients for counseling, I would need a way to bring all their relevant information up quickly so I am able review (quickly) before a session. Dumb question-can a link in The Archive bring up a pdf or docx? Not natively, no. I suspect someone could write a keyboard maestro action to do so from a link. But for me, I just copy the UID, paste it into a finder search, and I have all relevant documents listed. I'd opt for mediapathics solution. No additional software is needed which is always a benefit.